You can upgrade/downgrade/crossgrade your TARDIS to another type or simply change the wall and floor blocks with the TARDIS Desktop Theme. Changing the desktop theme requires a player to have the tardis.upgrade permission, and consumes a set amount of Artron Energy (the amount of energy is set in artron.yml). If you are just changing the walls and floor of your current TARDIS the Artron cost is less (you can set the reduction with the just_wall_floor: [percent] option in artron.yml. The speed at which the change happens is linked to the growth.room_speed config option. 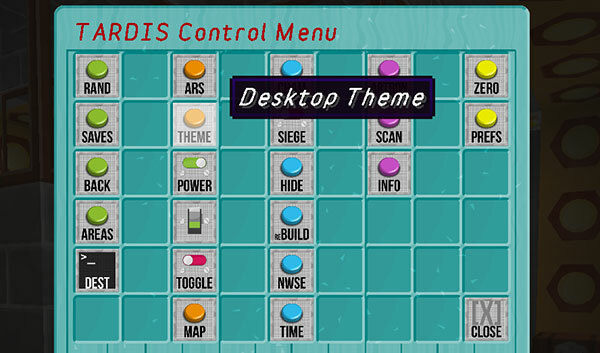 You can open the desktop theme GUI from the TARDIS Control Menu, with a command, or by right-shift-clicking the ARS sign. Run the command, or right-shift-click the ARS sign to open the GUI. When the GUI opens — select the TARDIS you want to change to — this can be the same type as you currently have if you just want to change the walls and floor. If you don’t have permission for the TARDIS type or don’t have enough Artron Energy you won’t be able to select that TARDIS type. If there are rooms in the way when trying to upgrade to a bigger TARDIS, you will need to manually jettison them first (you must be using ARS, manually growing rooms is not supported). The TARDIS starts reconfiguring — you should be able to stay inside the TARDIS (if needed you will be teleported to a safe location). Watch in amazement as the TARDIS changes before your eyes. Sets whether to compare the amount of block changes before allowing an upgrade. Sets the maximum percentage of block change compared to the original schematic.